I know that many of you have been wondering all about the History Project. I’ve shared my personal reasons for doing this–a good part which was due to the loss of my mother and her stories–and I’ve even shared an excerpt of one of the prompts in PDF fashion just to give you an idea of what it’s all about. I now have one more excerpt to share. I felt like it was important to share this story because I think that taking on a journey like this one can produce amazing and unexpected surprises. I believe that everything happens for a reason. I let my heart guide me on this journey as to the things I wanted–or needed–to share. Many of the prompts I love the most have been inspired by an unexpected moment or a memory or thought process that would not have occurred at any other time than when it was actually written. I am grateful for these prompts and the stories I’ve written. It may just be my own personal gratitude, but I’m hoping that you benefitted from them as well. I am in the middle of wrapping up the last handful of History Project prompts from 2013. Yes, they are a little late. But like I say, I truly believe that everything happens for a reason. The most visible reason to me was the prompt I had just been working on. It has to do with New Year’s Eve. Here is my little treasure box. I don’t really have any specific memory of New Year’s Eve. I’m not exactly sure why with the kind of memory I have. But I do have one thing that I saved from New Year’s Eve in 1974. I had this tiara saved in my box that I got my Christmas skates in just the week before. It’s funny that I have had this saved all through these years…almost forty years! The box saved my treasures, including some Valentines from my teacher and my ‘boyfriend’, old empty film rolls and boxes, a stapler, a turquoise bracelet and a few other random things. When I pulled out the box to find the New Years items (now item) that I knew were in there, I carefully looked at everything in there. Some things I look at and have no idea why I saved them. But I looked at the Valentines and saw one from my first childhood crush and thought that was so cool that I still had that. I thought it was awesome that I’d saved the early method of ‘home movies’. Some paper folding items that I must have thought were cool–I have no idea why. I do remember loving the tiny little Swingline stapler. Even at eight years old I obviously had a thing for office supplies. Don’t even get me started on using the mimeograph machine and the smell of it. I thought it would be fun to share some of the items not only in my entry for the day, but also on Facebook, just for fun. And this is where it got interesting for me and more meaningful than I could ever have even imagined. I don’t remember the circumstances of getting the turquoise bracelet. I didn’t even remember why it would have been special and placed in this box among all these random things. But when I posted it on Facebook, my aunt commented on it, like I hoped she might. I hoped she would have the memories behind this bracelet, but I had no idea just how cool they would be. It was a bracelet given to her by my mother–her oldest sister–when she was visiting her in Ashland one year. She was in high school and apparently wore it often on dates. She thinks my mom gave it to her somewhere between 1964 and 1966. I thought it was only 40 years old, but apparently I needed to slap on a decade, give or take. How amazing. Just simply amazing. I would never have thought when I started this particular prompt that it would have turned out to be such a wonderful gift to me. It seems only fitting that the whole reason why I did this project–the loss of my mother’s stories–would end (almost) with something so unexpected and incredibly meaningful to me. A little gift from my mother above, perhaps. My treasure at the end of this journey. Believe me when I say, I had different ideas going in my head about all this. But this particular Saturday, as I was trying to wrap up the prompt, I had thoughts in my head that I hadn’t had before. 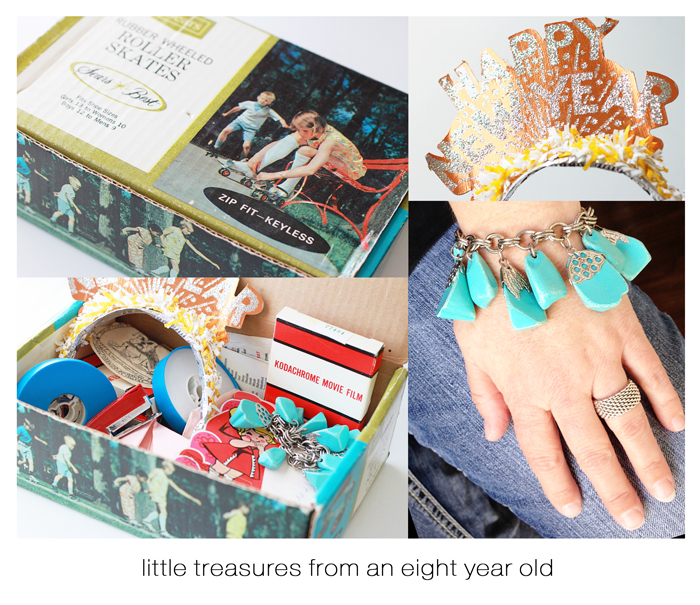 Thoughts about sharing the items in the box–besides the tiara–and sharing them on Facebook. I had no intention of doing that before. Had I not done that, I would not have discovered the true meaning behind that bracelet. And I am now forever grateful for how the events unfolded. It was more than I could have even hoped for. Who knew that a topic on New Years–a topic I have very little memories on–would lead to a treasured item bought by my mother. It’s funny how these little things can happen in our lives if we listen to our hearts and promptings. I’ve always listened to what my heart says to me and I don’t think it’s ever steered me wrong. This class has meant more to me than anyone can ever know. Even if all I did it for was for myself, it was still the best journey I could ever have hoped for…bumps and all. I have so enjoyed taking this journey through 2013 with so many of you. Your personal stories of what this has meant to you has touched me very deeply. I hope for another fabulous 2014 with the veterans, who may not have finished, along with a whole new group of ya! Just do it when you can. Very cool Kerri! I have enjoyed the class. What a great story! I’m always saying everything happens for a reason. I signed up for this class knowing I wouldn’t be able to tackle it in 2013 (and I had no idea you’d run it again), but I didn’t want to miss out. I’m doing it this year though and I’m excited to start! Thanks for the class Kerri. OMW this is just beyond cool! Awesome! Thanks for sharing. I am so behind writing my history. Love the prompts and keep looking at them… loving the flood of memories that come to me .. I know, I should be writing them. I am just enjoying all I am remembering!